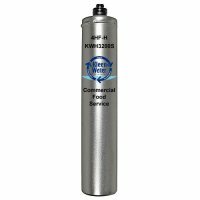 The 4HF-H Hoshizaki (KWH3200S) replacement water filter by KleenWater is rated for an impressive 14,000 gallon capacity at 2.1 gallon per minute flow rate. This is an ideal choice for the commercial food and beverage industry. It is recommended to change this cartridge every 6 - 12 months. The (KWH3200S) Hoshizaki 4HF-H is comprised of granulated activated carbon which is compressed into a rigid carbon block. This design provides dirt / sediment filtration, taste odor chlorine adsorption and chemical removal. The phosphate ingredient maintains ice machines by reducing scale which will protect the distribution lines, evaporator plate and pump. The Hoshizaki 4HF-H replacement filter is for value conscious customers who are using existing permanent heads but would like an alternative cartridge option with exceptional performance. Made in the U.S.A.